A few months ago, if anyone had told me I would be attending a liberal led protest, I would have laughed in his or her face. But because of a recent executive order, what I once thought was unlikely became a reality. Last Sunday, thousands gathered in airlines across the country to protest president Trump’s current ban. Personally, I attended the protest held at DTW—located in the Metro-Detroit area. There were people of all different ages and ethnicities at the event, but unity was the theme. 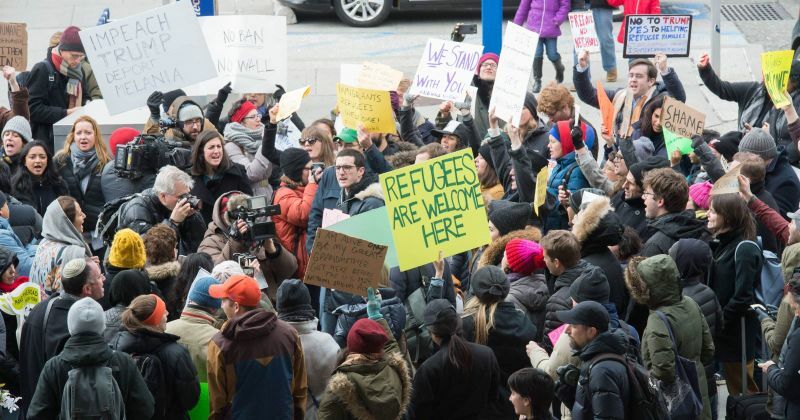 From terminal to terminal, crowds were chanting: “Immigrants are welcome here” and “Let them in!” And at one point, to assist some citizens in their attempts to pray, multiple protesters laid their signs on the ground to be used as prayer mats. Similar to those students, I too felt an obligation to demonstrate against the president’s recent actions. Simply put: the ban president Trump has created, specifically the part that has troubled green card holders, is a deplorable piece of law because it has no known rational basis or merit. In other words, parts of it sadly paints the party of Lincoln as an Islamaphobic hate group and does so for no reason. Conservatives believe in preventing people from unlawfully immigrating to US; we do not believe in banning innocent people, who are our allies, and more importantly people who have followed the rules when migrating to America. Thus, part of this law, by definition, is not conservative and does not represent conservative values. To be candid, I probably would have entertained an order that only tightened security on refuges. The president has access to information and briefings that lay people do not. It is possible we may need “extreme vetting” for national security purposes.But what the president has recently done is far removed from this. As mentioned earlier, this ban targets not only refugees, but people who have lawfully gained access to American soil. Further, it does not even target countries whose citizens have actually proven to be a threat to the US, such as Egypt or Saudi Arabia. This ban, therefore, will most likely not lead to better security, but rather the separation of families and the losses of opportunities for people who actually follow the rules. Now, having attacked part of this executive order, I have to be clear on one last point. Although I disagree with the president on this issue, it does not mean that I am denouncing his presidency. Regardless what some are arguing, it is too early to make such a decision. The president still has a chance to change his mind on the ban and to accomplish actual conservative goals (e.g., replacing Obamacare, appointing conservative justices, job growth,et cetera). His next chance to make an actual conservative decision will be this week, when he plans to announce his Supreme Court nominee to fill the late Justice Scalia’s seat. Also, in 90 days, the president will be faced with the decision to either cancel or renew his ban. When that time comes, or sooner, hopefully he choses to either limit the order or remove it completely.